The danger isn't over once a wildfire has passed. Flooding and erosion caused by uncontrolled runoff from denuded slopes can severely impact downstream lands and structures. Because of these secondary fire effects, post-fire treatments are a critical part of a wildfire response plan. This section will introduce different types of post-fire treatments that can be used on hillslopes, in channels, and along roads and trails. For each treatment the entry describes what it is, why and where it's used, and its effectiveness as reported in the scientific literature. Before considering treatments, ask what are the priority values at risk in my community? Be wary of a 'solution in search of a problem.' Focus on the identified priority values. Click here for a table of treatment comparisons to compare your goal with effective methods. See the 'Who Can Help' section for potential sources of technical and financial assistance for post-fire treatments. A PDF version of the treatments outlined here is available. What – Straw, woodchips or fiber materials are applied to burned areas using ground or aerial application. Purpose – By providing immediate ground cover, mulch is intended to reduce surface erosion, reduce downstream peak flows by absorbing rainfall, and secure seeds stored in the soil or applied as emergency treatment. Mulch also provides favorable moisture and temperature regimes for seed germination. Effectiveness – Straw mulch was reported as highly effective in reducing surface erosion when application rates exceeded 60% ground cover, and sometimes effective in reducing runoff. Sites prone to high winds reported reduced effectiveness. A combination of mulching and seeding was reported as more effective than seeding alone in regards to germination, but not necessarily in regards to surface cover. Wood based mulches (manufactured products and shredded on-site trees) were equal to or more effective than straw mulch in reducing post-fire erosion. Areas with moderate- or high-burn severity. Due to cost, there usually needs to be prioritization for mulch application, focusing on where there is a threat to life and property. This may include steep slopes adjacent to communities, roads, and infrastructure; critical headwaters that feed municipal water supplies; and waste sites that pose serious environmental threats. How to Link – See USDA BAER Catalog page 27 (PDF page 35). What – Lightweight synthetic or organic mats (netting or blankets) staked to soil surface. Purpose – Intended to provide temporary (several months to years) soil stability to special interest sites (e.g., heritage resources) until vegetation can establish. Mats also reduce soil temperature and provide moisture conservation. Effectiveness – products are expensive, but effective when installed correctly. Small areas with high values at risk. How to Links – See USDA BAER Catalog page 37 (PDF page 45); and NRCS Erosion Control Mats Fact Sheet. What – Mini-dams built with straw, logs, or rocks; size depends on channel gradient. Purpose – Temporary erosion control measure designed to trap and store sediment mobilized from hillslope. Also intended to reduce downcutting and attenuate peak flows. Effectiveness – All types of checkdams appear to work better when implemented in gentle gradients, high in the watershed, and placed in a series. Problems with checkdams include complete structure failure from large storms. In-channel treatments without adjacent hillslope treatments are ineffective. Swales with gentle gradient that allow for sediment storage. High-burn severity areas with highly erodible soils. Areas with less than 20-percent ground cover. Areas with high values at risk. Watersheds with small drainage areas, generally less than 5 acres. How to Links - See USDA BAER Catalog page 84 (PDF page 92); and NRCS Rock Check Dam Fact Sheet. What – Altering road template. Outsloping is accomplished with an excavator, dozer, and grader (the excavator pulls back fill and places the material in the ditch; the dozer assists in moving and reshaping the road profile; and the grader completes the final profile). Purpose – Disperse water along fill slope and reduce erosion; prevent concentration of flow on road surface that would otherwise cause rill, gully, and rut erosion. Effectiveness – No effectiveness monitoring data is available. Informal observations indicate immediate and long-term facility and resource benefits, including less sediment delivered to stream channels and reduced road maintenance. In areas with highly erodible soils, outsloping roads with unvegetated soils may increase erosion. Outsloping is often combined with other road treatments, including rolling dips and armored crossings to control water. Within areas of high- and moderate-burn severity where loss of control of water is a risk particularly on flat road grades (< 10%). How to Link – See USDA BAER Catalog page 106 (PDF page 144). In recent years, New Mexico residents have witnessed runoff, flooding, erosion, and debris flow events following severe wildfires. These secondary fire effects can have significant and long lasting impacts to communities, private landowners, and high-value infrastructure. Mitigating these secondary fire effects using post-fire treatments is of great interest to stakeholders affected by severe wildfires. 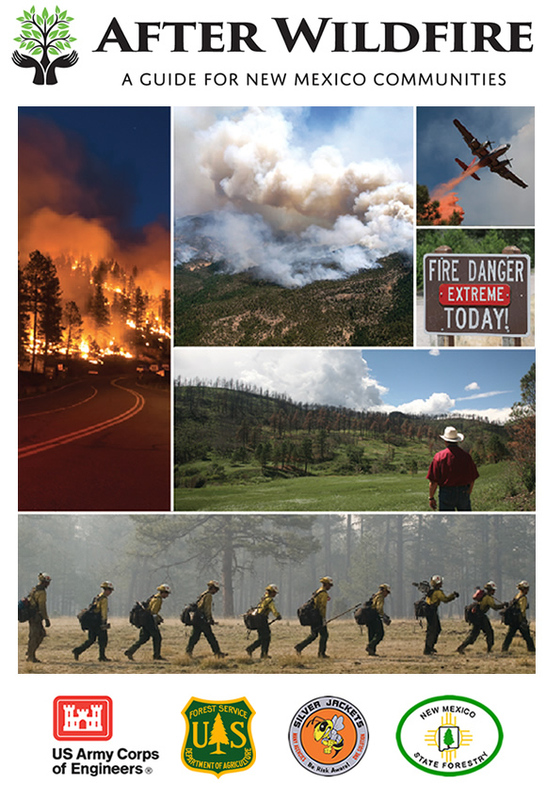 This guide is designed to provide communities and individuals a primer on the different types of post-fire treatments, as well as a review of their effectiveness as reported in the scientific literature. After a wildfire, federal, state, and local partners often work together to assess fire impacts and prioritize areas for post-fire treatment. These assessments identify focus areas such as severely burned watersheds, steep slopes, areas where runoff will be excessive, and other values at risk such as infrastructure. Before implementing any treatments, it is recommended that individuals and communities consult with experts in the post-fire treatment profession who can provide perspective, insight, guidance, and advice in an ever evolving field of practice. Engineers and hydrologists are particularly important when considering any type of in-channel treatment. In some cases, permitting may be necessary before implementing treatments (contact your county permitting department, the U.S. Army Corps of Engineers, and/or the New Mexico Environment Department). Keep in mind, differing opinions exist about the use and effectiveness of various post-wildfire treatments. It is not uncommon for one practitioner, for example, to have an affinity for a particular treatment based on personal experience, while another’s experience contradicts the firsts. In fact, differing opinions and results are to be expected depending on how and where treatments are implemented as well as post-fire weather. In an attempt to address this circumstance, the authors of this section have based this review on published scientific studies where available (see references). Nonetheless, treatment effectiveness reviews are not intended to discount professional judgment and knowledge of place. Inclusion of treatments in this guide should not be interpreted as an endorsed of its viability or usefulness, but rather a simple accounting of its historic use. Consider the following anecdotal story from the 2002 Missionary Ridge Fire in Colorado that illustrates how different objectives and experiences may call for different treatments and approaches, and how not all individuals or communities will have the same objectives, approaches, or in some cases financial resources. Photo: Example of multiple post-fire treatments: debris basin, slash/mulch spreading, and silt dams. The authors of this section of the guide hesitated to include a cost estimate for each of the treatments as this information is inherently variable and ever changing from year to year and location to location. However, we included it nonetheless in an attempt to provide some measure of comparison between treatments. Costs estimates came almost exclusively from Burned Area Emergency Response Catalog (2006). Much of the text for this review comes directly from the following publications: Evaluating the Effectiveness of Postfire Rehabilitation Treatments by Robichaud, Beyers, and Neary (2000); Burned Area Emergency Response Treatments Catalog from the USDA Forest Service (2006); A synthesis of postfire road treatments for BAER teams: methods, treatment effectiveness, and decision making tools for rehabilitation by Foltz, Robichaud, and Rhee (2009); and Post-fire treatment effectiveness for hillslope stabilization by Robichaud, Ashmun, and Sims (2010). We welcome your comments about this section. To send us a note, click on 'Contact' in the footer of this website. What – Combinations of organic fibers (e.g., wood shreds, paper, cotton, flax, etc. ), tackifiers (i.e., glue), suspension agents, and seeds are mixed together with water and applied to the soil surface via ground or aerial applications. Purpose – The matrix formed by hydromulch creates an immediate cover and holds moisture and seeds on steep slopes, which fosters seed germination while holding soil in place. Effectiveness – Hydromulch may reduce sediment yields during the first few rainfall events (long-term effectiveness is unknown). Treatments are more effective on short slope lengths vs. longer slopes due to susceptibility to concentrated flows. This method is wind resistant. Multiple factors impact effectiveness (e.g., application rates, slope length and steepness, make/brand of tackifier). Aerial application on inaccessible, highly erodible soils following moderate or high fire severity. Ground application on highly erodible soils near roads. Due to cost, there usually needs to be prioritization for mulch application, focusing on where there is a threat to life and property. This may include steep slopes adjacent to communities, roads, and infrastructure; also critical headwaters that feed municipal water supplies, and waste sites that pose serious environmental threats. How to Links – See USDA BAER Catalog pages 15 and 22 (PDF pages 23 and 30); and NRCS Hydromulching Fact Sheet. What – Logs are partially entrenched or/and staked to soil surface parallel to the contour. Purpose – Intended to slow runoff, cause localized ponding, and capture and store eroded sediment when arranged in a bricklayer pattern on hillslopes. Effectiveness – Studies indicated that log erosion barriers may reduce runoff, peak flows, and sediment yields for low intensity rain events (< 1.8” per hour), but are unlikely to have a significant effect for high intensity rain events. Sediment storage was reported to decrease by 10–15% with each successive rain event. Although the potential volume of sediment stored is dependent on slope, tree size and length, frequency, and use of berm traps, with proper implementation effective sediment storage and creation of microsites can be achieved. Please note: some agencies, such as the US Forest Service, no longer endorse this method. However, other users have reported success with this method when logs are properly placed and secured. Please consider the cost, ease of application, and safety, and consult with experts in the post-fire treatment profession who can provide perspective, insight, guidance, and advice in an ever evolving field of practice. Hillslopes with high- and moderate-burn severity. Slopes between 25 and 60 percent. Soils with high erosion-hazard ratings. Watersheds with high values at risk. How to Links – See USDA BAER Catalog page 45 (PDF page 53); and NRCS Log Erosion Barriers Fact Sheet. What – Directionally felling trees in a staggered herringbone pattern with tops pointed upstream. Purpose – Intended to trap floating debris and suspended sediment. Over time, large woody material dissipates stream energy, provides cover and habitat for fish while providing long-term channel stability. Effectiveness – Directional felling appears to work better when implemented in gentle gradients, high in the watershed, and placed in a series. Problems include complete structure failure from large storms. In-channel treatments without adjacent hillslope treatments are ineffective. Channels where energy dissipation is necessary. Channels with unstable bedload and high sediment-loading potential. How to Link – See USDA BAER Catalog page 90 (PDF page 98). What – Altering road template. Purpose – Rolling dips are used to drain water effectively from the road surface and prevent concentration of water. Effectiveness – No effectiveness monitoring data exists on rolling dips. Rolling dips and outsloping are common treatments used to disperse flows and prevent stream diversion. Rolling dips are constructed easily with a dozer but often are too short in length, or too shallow to contain the expected flows. Often, a rolling dip/water bar is armored and used instead of a culvert upgrade because of its relatively low cost. However, it may erode away with strong currents in high discharge. Roads with a continuous grade and infrequent drainage structures. Roads with grades less than 15 percent. How to Links – See USDA BAER Catalog page 110 (PDF page 118); and additional illustrations. What – Felling, lopping, and then scattering trees and brush by hand or mechanical equipment. Purpose – Intended to provide increased ground cover to reduce raindrop erosion. Effectiveness – Scattering slash created by chain saw is generally ineffective due to slow labor production rates and the large amount of material needed for adequate soil cover. However, mechanized equipment (e.g., hydro ax) that masticates material is considered moderately effective. Burn sites with moderate or high fire severity. How to Link – See USDA BAER Catalog page 33 (PDF page 41). What – Fiber rolls, commonly called wattles, are prefabricated rolls manufactured from rice straw and wrapped in degradable netting. In some cases, on-site woody debris can be rolled in netting to reduce costs. Rolls are ~ 9 inches in diameter and up to 25 feet long. Purpose – Intended for low-surface flows not to exceed 1 cubic foot per second. They are not for stream channels or gullies. They are intended to reduce erosion by shortening the slope length to slow overland flow velocity as well as trap sediment and provide a seedbed for vegetative recovery. Effectiveness – Studies indicated that erosion barriers may reduce runoff and sediment yields for low intensity rain events (< 1.8” per hour), but are unlikely to have a significant effect for high intensity rain events. Wattles reduced total runoff and peak flow rates (Robichaud et al. 2008 and 2010). Areas of high- and moderate-burn severity. Slopes with < 40% ground cover. How to Links – See USDA BAER Catalog page 51 (PDF page 59); and NRCS Contour Wattles Fact Sheet. What – Structure made of rocks, logs, or plant material installed in ephemeral channels at the grade. Purpose – Provide grade control in channels that may become destabilized from increased storm runoff and velocities. Intended to prevent incising and downcutting in channel. Effectiveness – Little quantitative data is available. This treatment may be most effective for areas of low or moderate flows. Grade stabilizers are likely to work better when implemented in gentle gradients, high in the watershed, and placed in a series. Problems include complete structure failure from large storms. In-channel treatments without adjacent hillslope treatments are ineffective. Large areas of high-burn severity in watershed. Seasonal channels with low to moderate flows. Channel gradient less than 6 percent. How to Links – See USDA BAER Catalog page 94 (PDF page 102); and NRCS Grade Stabilizers Fact Sheet. What – Structures such as armored rolling dip, overside drain, or imbricated (overlapping) rock-level spreader. Purpose – Used on roads to control runoff across the road prism and to protect the road fill. Armored rolling dips provide increased water flow capacity when hydrologic analysis indicates the current pipe size is too small for the short-term increased storm runoff created by fire. Dips prevent stream diversion by safely channeling increased flows back into the channel. Overside drains (berm drains and down drains) are placed in stream crossings where no culvert or armoring exists and in locations where the embankment (fill slope) needs protection. Imbricated rock-level spreaders have been used on high standard roads including highways and county roads. The imbricated rock-level spreader is a permanent structure that is built with large rock placed in a stairstep (shingled) design on excavated benches with either little or no grade along the revetment’s length. The spreader protects the road fill from overland flows. Effectiveness – Armored rolling dips are effective low-cost treatments when properly designed and implemented. Qualitative monitoring data of armored rolling dips found erosion problems when the dip was too short and when insufficient riprap was used on the fill slope. Overside drains fail if not properly designed, installed, and maintained. Initial qualitative monitoring indicated imbricated rock-level spreaders (rock armored overflow) are effective when they discharge directly onto a vegetated/wooded zone. Roads located below high-and moderate-burn severity areas. Road segments that have a long continuous grade and infrequent drainage. Costs – Treatment vary in cost. Cost estimates can be developed based on material and installation requirements. How to Link – See USDA BAER Catalog page 115 (PDF page 123). This section includes an index with links to information on different treatment options after a wildfire, including Hillslope Treatments, Channel Treatments, and Road and Trail Treatments. What – Aerial and ground application of seed across large areas. Native seed mixes are preferred, but non-invasive, non-native seed mixes are also used, often with sterile annual grass seeds or cereal grain seeds. Purpose – Intended to reduce soil erosion. Effectiveness – Seeding was generally reported as ineffective (i.e., provided < 60% surface cover) the first year following fire and neutral in subsequent growing seasons following fire. However, when combined with mulching, the potential for germination may increase as a result of seed and moisture being held by mulch. Sterile annual seeds and cereal grain seeds that germinate can reduce soil erosion after fire, yet not compete with native grasses in subsequent years. Please note that seeding has the possibility for introducing invasive and noxious species, so be aware of this possibility. Hillslopes with moderate and high fire severity. How to Links – See USDA BAER Catalog page 64 (PDF page 72); and NRCS Seeding Fact Sheet. What – a permeable fabric installed parallel to the contour and anchored with wooden stakes or metal t-posts. Purpose – Intended to trap sediment and protect areas with high values at risk including heritage resources, water quality, and aquatic resources. Effectiveness – Studies reported notably high effectiveness when fences were installed properly (i.e., anchored into soil and water allowed to pass through slowly while trapping sediment) and maintained (which requires significant effort and attention). Robichaud and Brown (2002) measured trap efficiency at over 90 %. Areas accessible for inspection and maintenance. How to Links – See USDA BAER Catalog page 56 (PDF page 64); and NRSC Silt Fence Fact Sheet. What – Reinforcement of streambank with protective covering, such as rocks, vegetation or engineering materials (including boulders, riprap, and gabion baskets). Purpose – Reduce bank cutting and erosion due to peak flows. Effectiveness – No quantitative effectiveness monitoring data exists for this treatment. Streambank armoring is likely to work better when implemented in gentle gradients, high in the watershed, and placed in a series. Problems include complete structure failure from large storms. In-channel treatments without adjacent hillslope treatments are ineffective. How to Link – See USDA BAER Catalog page 97 (PDF page 105); and National Engineering Handbook - Streambank Armor Protection. What – Culverts are temporarily removed and replaced with natural fords, vented ford pipes, and low water bridges during extreme runoff events. Purpose – To prevent stream diversion and keep water in its natural channel. This prevents erosion of the road fill, reduces adverse effects to water quality, and maintains access to areas once storm runoff rates diminish. Effectiveness – Ford crossings effectively eliminate loss of water control at road/stream crossing. However, poor design or implementation can result in damage to infrastructure and reduced water quality. Informal monitoring indicates that flexible structures adjust to changes and are not prone to undercutting. Boulder or riprap structures are long enough to avoid being outflanked by high flows. Jersey barriers are less effective as an endwall material since they are not flexible. Roads crossing ephemeral or seasonally flowing channels. Culverts that are at risk of plugging and diverting from increased runoff and bedload. Road crossings where high sediment delivery is expected. Roads where water overtops the road continuously or intermittently during and following mild floods. How to Link – See USDA BAER Catalog page 122 (PDF page 122). After a wildfire, it may be difficult to ascertain which treatment or combination of treatments will help you meet your objectives. The tables below list objectives you may have and which treatments can best achieve them. For an index of treatments that links to more information, click here. No ranking indicates objective is not applicable to treatment. What – Hand tools or mechanical equipment are used to break up and loosen topsoil to increase surface roughness. Purpose – Intended to break down hydrophobic layer, prepare seedbed, and increase infiltration rate. Effectiveness – Generally, this treatment did not provide significant improvement (e.g., reduced sediment yield) as compared to no treatment (Rough 2007). Slopes with high erosion potential. How to Links – See USDA BAER Catalog page 60 (PDF page 68); and NRCS Mechanical Scarification Fact Sheet. What – Engineered structures such as j-hooks, rock barbs, and single- or double-wing deflectors. Purpose – Designed to direct increased streamflows and velocities away from unstable banks or structures of value such as a road parallel to the channel. Effectiveness – There is no documented effectiveness monitoring data for this treatment. Channel deflectors are likely to work better when implemented in gentle gradients, high in the watershed, and placed in a series. Problems include complete structure failure from large storms. In-channel treatments without adjacent hillslope treatments are ineffective. Locations where roads are parallel to stream channels. Locations where facilities are at risk from streambank erosion or flooding. How to Links – See USDA BAER Catalog page 99 (PDF page 107); and Flow Control Structures. What – Culvert modification addresses flooding and debris concerns as a result of fire. Usually involves upgrading the culvert size for increased runoff and associated bedload and debris. Purpose – By increasing the flow and debris passage capacity, road damage is prevented or reduced. Effectiveness – Evaluation of this treatment is only qualitative. The treatment rates ‘well’ when new culverts are installed prior to the first rains. ‘Poor’ ratings reflect the inability to perform the upgrade in a timely manner or when culverts are still not large enough to handle runoff events. How to Link – See USDA BAER Catalog page 128 (PDF page 136). Bedload: the sand, gravel, boulders, or other debris transported by rolling or sliding along the bottom of a stream. Channel Deflector or Vane: act to guide flow away from bank, reduce bank erosion, promote local sedimentation and encourage vegetation growth. Common names and designs include j-hooks, rock barbs, and single- or double-wing deflectors. Debris Flow: a moving mass of mud, sand, soil, rock, water and in the case of wildfires, woody material (tree branches of all sizes) that travels down a slope under the influence of gravity. Ephemeral Stream: ephemeral portions of streams flow only in direct response to precipitation. Dry washes and arroyos are generally classified as ephemeral streams. Fill slope: the surface area formed where soil is deposited to build a road or trail. Inslope (road): grade slopes toward inside ditch. Outslope (road): grade slopes toward fill slope. Outsloping: the downhill side of a road where the side of the road slopes with the hill at or near the natural contour and runoff is allowed to drain down the hill without being channeled into a ditch or other water-control device. Outslopes are usually associated with a road in steep terrain which is literally cut into the side of the hill. Overside Drains: pipes, downdrains and spillways used to protect slopes against erosion by collecting surface runoff and conveying it down the slope to stable drainage. Road Template: the shape and cross-sectional dimensions of a roadway. Runoff: Movement of water across surface areas of a watershed during rainfall events. Slope/Grade: refers to the inclination of a physical feature, landform or constructed line to the horizontal. What – Specially engineered and constructed emergency basin for storing large amounts of sediment moving in an ephemeral stream channel. Designed to trap at least ~ 50–70 percent of expected flows. Purpose – Designed to store runoff and sediment; often the last recourse to prevent downstream flooding, sedimentation, or threats to human life and property. Provide immediate protection from floodwater, floatable debris, sediment, boulders, and mudflows. Effectiveness – No quantitative information is available on effectiveness. Debris basins are considered to be a last resort because they are expensive to construct and require commitment to long-term repeated maintenance following runoff events. Areas with moderate- to high-burn severity. Areas where high-value resources are imminently threatened. Sites with the capacity to trap the estimated debris flow volume. Sites with access available for construction and maintenance. How to Links – See USDA BAER Catalog page 102 (PDF page 110); NRCS Sediment Basin Fact Sheet; and Debris Dam Publication. What – A debris rack is a structure placed across a stream channel to collect debris before it reaches a culvert entrance. A debris deflector is a structure (usually V-shaped with apex pointed upstream) placed at the culvert inlet to route the major portion of debris away from the culvert entrance. Purpose – Designed to protect culverts from catastrophic failure by catching floatable debris that otherwise would likely plug culverts and cause stream diversion. By protecting culverts from failing, these structures protect transportation infrastructure, public safety, and downstream resource values. Effectiveness – No quantitative data exists on the effectiveness of debris structures. However, anecdotal information indicates they can be effective with proper implementation and maintenance. Problems can occur if the design structure is too small for the stormflows and associated debris. Culverts at risk of plugging with debris. Where downstream infrastructure, public safety, or other resources are at risk. How to Link – See USDA BAER Catalog page 134 (PDF page 142). deWolfe, V.G. ; Santi, P.M.; Ey, J.; Gartner, J.E. 2008. Effective mitigation of debris flows at Lemon Dam, La Plata County, Colorado. Geomorphology. 96: 366-377. Foltz, R.B. ; Robichaud, P.R. ; Rhee, H. 2008. A synthesis of postfire road treatments for BAER teams: methods, treatment effectiveness, and decision making tools for rehabilitation. Gen. Tech. Rep. RMRS-GTR-228 Fort Collins, CO: U.S. Department of Agriculture, Forest Service, Rocky Mountain Research Station. 152 p.
Napper, C. 2006. Burned Area Emergency Response Treatments Catalog. Technical Report. 0625 1801-SDTDC, Washington, D.C.: U.S. Department of Agriculture, Forest Service, National Technology & Development Program, Watershed, Soil, Air Management. 266 p. [Online]. available: http://www.fs.fed.us/eng/pubs/pdf/BAERCAT/lo_res/06251801L. Peppin, D.L. ; Fule, P.Z. ; Sieg, C.H. ; Beyers, J.L. ; Hunter, M.E. ; Robichaud, P.R. 2011. Recent trends in post-wildfire seeding in western US forests: costs and seed mixes. International Journal of Wildland Fire 20(5): 702-708. Robichaud, P.R. ; Ashmun, L.E. ; Foltz, R.B. ; Showers, C.G. ; Groenier, J.S. ; Kesler, J.; DeLeo, C.; Moore, M. 2013. 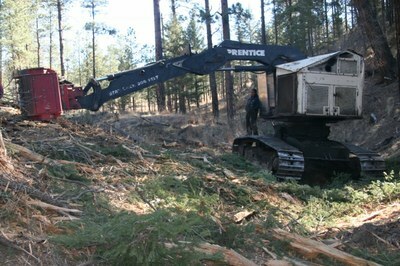 Production and aerial application of wood shreds as a post-fire hillslope erosion mitigation treatment. General Technical Report RMRS-GTR-307. Fort Collins, CO: U.S. Forest Service, Rocky Mountain Research Station. 31 p.
Robichaud, P.R. ; Ashmun, L.E. ; Sims, B.D. 2010. Post-fire treatment effectiveness for hillslope stabilization. Gen. Tech. Rep. RMRS-GTR-240. Fort Collins, CO: U.S. Department of Agriculture, Forest Service, Rocky Mountain Research Station. 62 p.
Robichaud, P.R. ; Beyers, J.L. ; Neary, D.G. 2000. Evaluating the effectiveness of postfire rehabilitation treatments. Gen. Tech. Rep. RMRS-GTR-63. Fort Collins: U.S. Department of Agriculture, Forest Service, Rocky Mountain Research Station. 85 p.
Robichaud, P.R., Brown, R.E. 2002. Silt fences: an economical technique for measuring hillslope soil erosion. Gen. Tech. Rep. RMRS-GTR-94. Fort Collins, CO: U.S. Department of Agriculture, Forest Service, Rocky Mountain Research Station. 24 p.
Robichaud, P.R. ; Lewis, S.A.; Brown, R.E. ; Ashmun, L.E. 2009. Emergency post-fire rehabilitation treatment effects on burned area ecology and long-term restoration. Fire Ecology Special Issue 5(1):115-128. Robichaud, P.R. ; Pierson, F.B. ; Brown, R.E. ; Wagenbrenner, J.W. 2008. Measuring effectiveness of three post-fire hillslope erosion barrier treatments, western Montana, USA. Hydrological Processes. 22: 159-170. Robichaud, P.R. ; Wagenbrenner, J.W. ; Brown, R.E. ; Wohlgemuth, P.M.; Beyers, J.L. 2008. Evaluating the effectiveness of contour-felled log erosion barriers as a post-fire runoff and erosion mitigation treatment in the western United States. International Journal of Wildland Fire 17:255-273. Rough, D. 2007. Effectiveness of rehabilitation treatments in reducing post-fire erosion after the Hayman and Schoonover Fires, Colorado Front Range. Fort Collins, CO: Colorado State University. 186 p. Thesis. What – Riser pipes function to sieve debris and allow passage of water. Riser pipe allows accumulation of bedload sediments released from a drainage due to the loss of soil cover and reduced infiltration from water repellant soils. The sediment and ash captured in the basin can be removed with a backhoe. Purpose – Risers are used to protect road infrastructure, especially those with large fill, from failure. Riser pipes help prevent culverts from plugging with sediment and floating debris. Pipes capture sediment and reduce downstream impacts to water quality. Riser pipes also reduce peak flows by storing water and sediment. Effectiveness – No formal effectiveness monitoring data exists for risers. However, reports indicate risers performed well when maintained. Problems occurred when structures were not routinely checked and debris was not removed from the basin. Risers are temporary treatments that are easily disassembled when no longer needed. Risers are installed quickly and at a low cost. Access at road crossings with a culvert inlet is limited by conventional equipment (backhoe). Drainages with high-burn severity and erosion predictions indicate a high risk of sediment delivery. Channels that have high bedload transport capabilities. How to Link – See USDA BAER Catalog page 140 (PDF 148). What – Mechanical equipment is used to clean out organic debris and sediment deposits in stream channels, above culverts, and in catchment basins ahead of anticipated runoff events. Purpose – To prevent organic debris and sediment deposits from becoming mobilized in debris flows and flood events. Intended to protect transportation and facility infrastructure. Effectiveness – No quantitative effectiveness monitoring data is available on catchment basin cleanout. However, anecdotal information suggested the treatment is effective. Locations where cleanout can be done prior to the first damaging rain. Road crossings where existing sediment reduces culvert capacity. How to Link – See USDA BAER Catalog page 145 (PDF page 153). What – On-the-ground inspection and clean out, if necessary, of critical infrastructure during, after, or between precipitation events that may result in loss of water control. Purpose – Intended to keep culverts and drainage structures functioning on roads where access is required by cleaning sediment and debris from the inlet. The treatment is used in lieu of more costly upgrades that are not feasible due to expense or time frame. Storm inspection and response performed during runoff events should be conducted with caution. Effectiveness – No formal effectiveness monitoring data exists on storm inspection and response. Informal observations indicate cost effectiveness because some road problems are avoided with timely clearing and cleaning of road crossings. However, challenges include maintaining a dedicated inspection team over time, and where excessive areas to patrol result in inadequate coverage. Road crossings where high sediment and debris is anticipated. Road access is necessary throughout the storm season. How to Link – See USDA BAER Catalog page 150 (PDF page 158). What – Trail stabilization methods include rubber belt and rock waterbars, rock spillways, and rolling dips. Purpose – Designed to provide drainage and stability to reduce trail damage and erosion. Effectiveness – No quantitative data exists on the effectiveness of this treatment. On trails lacking adequate drainage features for anticipated runoff. Trails within or below high-burn severity areas. Trails with sustained grade through burned areas that lack adequate drainage. Trail segments that have the potential to deliver sediment to streams. Trails where previous drainage structures were damaged by the fire. How to Link – See USDA BAER Catalog page 153 (PDF page 161). What – Mechanical equipment such as an excavator or dozer is used to decommission unauthorized roads that are destabilized as a result of loss of vegetation following high burn severity. Purpose – Intended to improve infiltration, restore hillslope hydrology, and reduce erosion following subsoiling (tilling), recontouring road fill, and restoring drainage through the road prism using mechanical equipment. Effectiveness – No quantitative data is available on soil erosion rates. However, visual inspection revealed that treatment objectives to improve infiltration and reduce erosion by restoring the slope were achieved in treated areas. Hillslope with multiple unclassified roads. Areas with high-burn severity and high soil erosion potential. How to Link – See USDA BAER Catalog page 160 (PDF page 168).